During the first half of December, the US bank prime rate remained stable at 3.25 percent. Despite the continued consistency of the US bank prime rate, four of the six credit card categories listed above saw a change in their average rate during the first half of December. A change in the inflation outlook. Rising inflation can squeeze credit card profit margins unless credit card companies raise interest rates. Changes in market interest rates. Even if the US bank prime rate has not changed, more bond market rates may be changing more fluidly in reaction to economic trends. Adjustments to profit strategies. Depending on the conditions, credit card companies may drop rates to try to capture market share, or raise rates to draw wider profit margins from exisiting accounts. Shifting credit concerns. When creditworthiness is less of a concern, the spread between rate tiers for good credit customers and those for bad credit customers will tend to narrow. When default risk becomes a front-burner issue, credit card rates for bad credit customers will rise, thus widening this spread. 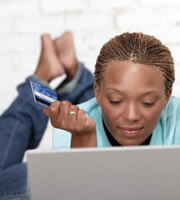 Because the changes to credit card offers in the first half of December were a mixed bag rather than all in step with a single trend, they are probably due to company-specific adjustments such as those described in the last two of the above reasons for changes, rather than being reflective of the systematic changes explained by the first two reasons above. Changes to consumer credit card offers made only a slight difference to the average rates, but represented structural changes which may reflect changing strategies on the part of credit card companies. Overall, consumer credit card rates dropped to 16.71 percent from 16.75 percent. Interestingly though, each of the categories of consumer cards went in a different direction. Rates on consumer non-rewards cards dropped to 14.71 percent from 14.88 percent, while rates on consumer rewards credit cards rose to 17.58 percent from 17.55 percent. Another structural change was that Chase adopted a single-rate approach for its rewards and non-rewards cards, rather than having lower and higher rate tiers depending on the customer's credit rating. The average rate for student credit cards ended a long stretch of stability by rising 27 basis points, to 16.86 percent. This was all as a result of one card eliminating its lower rate tiers. Given that relatively few students are likely to have the credit history to qualify for the best rate tiers, this is a change that may not affect a very large share of the market. Business credit cards, which were the only ones to change in the last survey, remained unchanged in the first half of December. Two trends over the past several months - the disappearance of some non-rewards credit cards, and the narrowing interest rate spread between non-rewards and rewards credit cards - suggest that credit card companies are favoring business rewards cards these days. The spread between rates for customers with good credit and those for customers with average credit narrowed considerably in the first half of December, dropping by half a percentage point to 3.57 percent. This suggests an easing of concerns over default risk. 0 Responses to "Student rates up, non-rewards rates down"